Hi. My name is Jerry Hinnen. I write for an Auburn website named The War Eagle Reader. But you may also remember my former blog, The Joe Cribbs Car Wash, for having once written that you “could [not] possibly be so shortsighted” as to hire Gene Chizik as Auburn’s head football coach. I wish I had not written that, for any number of reasons. I am sorry. But I’m not writing you today to apologize. I am writing for two reasons. 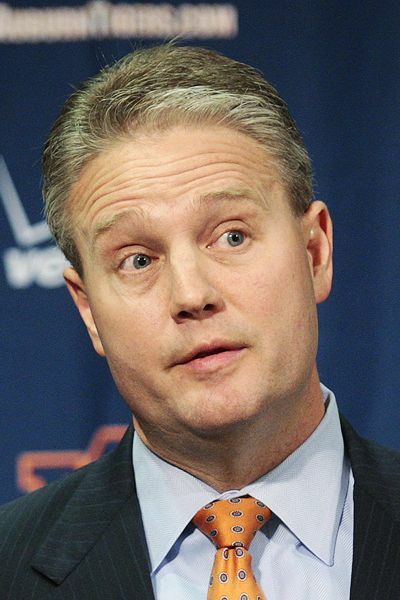 The first is to tell you how excited I am about the future of Auburn athletics. Like most Auburn fans, my favorite team and the one I follow most closely is the football team, and like most Auburn fans these days I cannot wait to watch our Tigers this fall. Thanks to what coach Chizik has accomplished in assembling his coaching staff; in putting together an exciting, unified, and hard-working Auburn team on the field; in making a concerted effort to connect to Auburn fans in methods both traditional and innovative; and in he and his staff’s hard work on the recruiting trail, I believe our football program has a bright, proud future ahead of it. But there’s much more to my excitement than that. The future looks just as bright for our basketball teams, thanks in large part to the Auburn Arena, which I have no doubt will become one of the country’s truly unique, truly special basketball venues the moment it opens. Thanks to the hire of Tony Barbee, whose professionalism, energy, and immediate recruiting successes have suggested there’s nothing but success ahead in his Auburn tenure, it’s my feeling that Auburn now has two head coaches worthy of the building they inherit. Much as I don’t expect a championship as soon as this season for coach Chizik, I’m not expecting Barbee to produce an NCAA Tournament berth in 2011, but it doesn’t matter; for the first time in many years, I am thrilled to see where Auburn men’s basketball takes us even regardless of the destination. Of the three so-called “revenue” sports, Auburn baseball has always been the one I’ve felt least invested in, but that’s changing with the increase in baseball coverage thanks to the Internet and this year’s charge under John Pawlowski. Pawlowski came to Auburn with a reputation as a pitching guru, but he has adapted to forge one of the SEC’s strongest teams on the back of the conference’s best hitting and a juggled rotation that’s gotten the job done even without the benefit of a traditional ace. I don’t think anyone would disagree that it’s been an outstanding job of baseball managing, and as with the football and basketball teams the future at Plainsman Park could be even better than the present. Our Olympic sports programs also seem to be in good hands, though I’ll take a moment to say how particularly encouraged I am by the Auburn volleyball team’s progress under Wade Benson. As a sport I’ve long had something of a soft spot for, it was disappointing to see that program lag so far behind the rest of the SEC for so long; having it on solid footing is a personal pleasure. Because of all these reasons and more, I believe this is a particularly great time to be an Auburn Tiger. I live a long, long way from the Plains, but I feel like I can sense the “buzz” from here. When I remember that dark November of 2008–when our football team was flailing, our men’s basketball team was still searching for improvement, our baseball team was a nonentity–it seems hard to believe that not even two years later, I would be irrepressibly optimistic about all three revenue sports and many more beyond. I am thrilled beyond anything I would have hoped ta that time. So this is the second reason I am writing: to thank you. You hired Gene Chizik. You hired John Pawlowski. You oversaw the approval and construction of the Auburn Arena. You hired Tony Barbee. If these are the reasons for my renewed excitement and optimism for Auburn athletics, then the first reason is the work you have done in bringing them to Auburn. I am not suggesting, Mr. Jacobs, that I agree with all of your decisions as Auburn athletic director. Some, such as inability to retain swimming coach David Marsh, continue to give me serious pause. I am not suggesting that your successes to date mean you should be free from criticism in the future. There remains the possibility that the coaches I just praised, whether through failure or scandal, will fail to make good on their current promise. But that possibility seems so distant that today, right now, with all three revenue teams so firmly on the path to sustained success, I am not remotely in the mood to criticize. Your actions have helped make Auburn athletics a joy again for me and many other Auburn fans. I cannot speak for them, but you have my gratitude, at the least. I’m glad you wrote this. I’ve been thinking that anyone who wants to make generalized criticisms against JJ needed to build their case from scratch and stop just taking for granted that he deserved such criticism. To date I believe the only blemishes on his record are the loss of Marsh (his replacement hire of Quick was solid though) and passing on the UCLA game (which I can understand from a financial perspective… much more than just ticket and concession sales). All the other things that got us mad now look slightly brilliant. The hiring of Chizik is especially impressive. Has any other major program taken such a daring risk in hiring a coach because they knew the guy and knew he would be the right fit. And because he took the risk he was able to pay fair market value and dictate that Jimmy Sexton be removed from the picture. Getting rid of that blood sucker may be the single most financially savvy move ever made at Auburn (it probably pays for the Arena… not really). Right now it all seems like very solid management. You guys do know that David Marsh left of his own free will, right? That being said, is it too much to ask to hook AU up with a premier neutral site game like a certain other team seems to have in the works… again! Concession sales aside, think of the recruiting bump, especially if they played a game here in Dallas (I’m suggesting that for totally unselfish reasons I assure you). I can’t believer this neutral site games do anything for recruiting….is there any kid in Atlanta that does not know about Auburn? There is nothing like the Tiger Walk and a football weekend on the Auburn campus to show a prospect what it would mean to be part of the Auburn family. Forget these games that are primarily for the benfit of the community in which they are played…and not Auburn’s students or alums. You’re an okay guy but if Tony Barbee lands us on probation, then I’m going to come find you. Stop allowing Auburn to be a stepping stone to other Universities! If the coach deserves to make what Texas, for example, is willing to pay them, OFFER MORE! That’s my only gripe! I don’t want 2 or 3 good years from Barbee, & watch him leave for a Big East or ACC program. Florida is proof that any team can go from nothing to back-to-back National Champs, & retain the coach that got them there. Trackin — I agree with your overall sentiments, but for the love of God stop adding the utterly mistaken, revisionist notion that our nonconference schedule in 2004 had ANYTHING to do with being left out. USC and Oklahoma were WIRE TO WIRE Nos. 1 and 2. To that point, the ethos among poll voters was “if you don’t lose, you don’t drop” — at least from the top two spots. Do you honestly think had Oklahoma not bought Bowling Green — a 9-2 bowl team that year — off our our schedule, forcing us to add The Citadel in the months leading up to the season, that we would have jumped Oklahoma? There was a clear double-standard that year among the national opinion makers. It was not a genuine “conspiracy theory,” just good ole fashioned group think. They decided early that Oklahoma and USC were juggernauts. They sent two players from each team to the Heisman ceremony and then used that circular logic as proof that they were the two best teams. Kirk Herbstreit, even though his network chose Atlanta as its venue the first Saturday in December, said after Auburn dismantled Tennessee “the two best teams are going to Miami.” Auburn lost votes after an eight-point win on the road against its archrival. Never mind that Oklahoma beat OSU on the road that year 38-35. Never mind that USC beat UCLA on the road that year 26-23 (or something like that). Facts didn’t matter. National narrative, settled long before Auburn made its case on the field, was settled. So, please, do not say anything that justifies the idea that an inherently subjective system made anything approaching an obejctive conclusion. It did not. By its very nature, it cannot. Our energies as fans should be geared to pushing for, at minimum, a four-team playoff. After all, haven’t the powers that be already conceded that we have a playoff. At its core, that’s what the BCS is: a two-team playoff. Expand it to the point that no major conference undefeated team or an established other power, like Boise State this year, can be shut out when they’ve done everything they can do through the season. War Eagle! Seriously, I have to agree with NOLA on this. Auburn played an extra game [SEC] and actually LOST style points for beating UT, by 8 points.